Quality Lock in Monroeville PA is a certified provider of residential and commercial locksmith services, as well as a wide range of safe and vault opening services. We offer all of our services at affordable, up-front prices, 24-hours a day/seven days a week. Our mobile technicians offer rapid response to all locksmith needs. Call Quality Lock for lock repair in Monroeville PA, Door Closer Repair Monroeville PA, and Door Closer Replacement Monroeville PA. Safe lock install. When you choose Quality Lock to install a new lock on your safe, you have chosen the very best. We draw upon nearly three decades of experience to remove the old lock and replace it with a safe lock that will ensure your property’s safety for years to come. Furthermore, we back our safe lock install work with 24-hour service if any problems should arise. Safe Unlock. The reality is that safe locks are complex mechanisms prone to occasional failure. While this can happen at any time and cause no shortage of anxiety and frustration, Quality Lock is a certified professional safecracker with the capability to unlock most safe locks without damage to your property. Our safe unlock expertise is unrivaled in the Pittsburgh region, which is why home and business safe owners call us first when their safes fail to open. Safe drilling. If your safe has been damaged and the lock cannot be cracked, Quality Lock offers expert safe drilling service around the clock to get your safe, vault, or container open as rapidly as possible. Granted, it’s never convenient to have a safe lock fail after a long day at the office. Rest assured that Quality Lock will respond quickly to your call and get any safe open with our years of proven safe drilling services. We will get your safe open, and we will do it successfully without harming the contents. 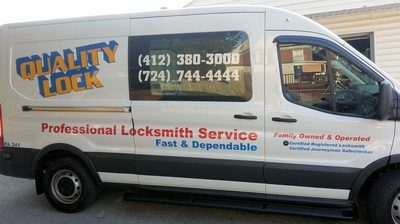 Quality Lock is a fully mobile 24-hour emergency locksmith serving Pittsburgh, Monroeville and Trafford. Since we focus entirely on providing locksmith services – as opposed to retail sales – we are available 24 hours a day for our current and future customers. Responding to and quickly resolving lockout and home or business security emergencies is what we are known for throughout western Pennsylvania. Residents of Pittsburgh, Trafford Township, and Monroeville have come to depend on Quality Lock for almost every conceivable emergency requiring a certified professional locksmith, at any time, and under any conditions. All 24-hour locksmiths are not the same. In fact, an alarming number of so-called “24-hour emergency locksmiths” exist solely to gouge customers in emergency situations, particularly during the off hours. These “scammer” locksmiths are not licensed, not certified, and definitely not trained professionals; and they certainly not have your best interests in mind. They are trained criminals, to put it bluntly. So protect yourself and call us, Quality Lock. Quality Lock is a licensed, insured, verified, and honest commercial mobile locksmith in Monroeville PA. 1800unlocks.com is a professional locksmith directory. Quality Lock is also a Safe & Vault Locksmith. When you need safes unlocked, safes repaired, safes moved, or safe combination changed, call Quality Lock a mobile locksmith in Monroeville PA.